Savannah Technical College HR employees stand with STC President Dr. Kathy Love. 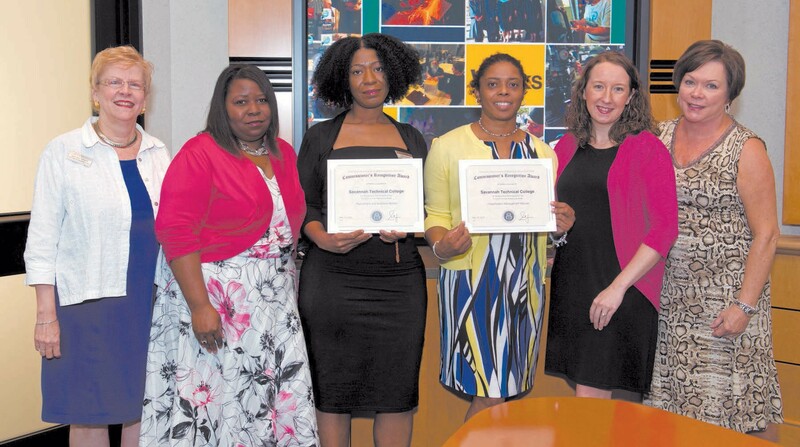 (Pictured left to right): STC Vice President of Administrative Services Sue Turner, STC HR Coordinator Desire Alexander, STC HR Coordinator Lakia Maxwell, STC Payroll Technician Samantha Allen, STC HR Director Melissa Banks, STC President Dr. Kathy Love. The State of Georgia recently honored Savannah Technical College with the Commissioner’s Recognition Award for model performance on the FY2015 Human Resources Audit. The award was given at the Georgia Department of Administrative Services Spring Human Resources Forum. The audit includes six modules. To earn the performance awards, the College scored 100% on the modules for Classification Management and Recruitment/ Selection. The College’s scores exceeded the state average for the other four modules. College serves Coastal Georgia with quality, market driven technical education with campus locations in Chatham, Effingham and Liberty Counties. Serving more than 10,000 credit and non-credit students annually, Savannah Tech offers nearly 150 different instructional programs in Aviation Technology, Business and Technology, Public Service, Industrial Technology, and Health Sciences in addition to Adult Education classes, industry-specific training and continuing education. The College is accredited by the Southern Association of Colleges and Schools Commission on Colleges.